BIM on Airport Project – Case Study: Terminal 4, Concourse B at JFK International Airport is a busy place. Add the complexity of managing multiple construction projects with multiple phases throughout the terminal, while maintaining uninterrupted service for the air train, curbside check-in, restaurants, services, and very active international and domestic gates, and the requirements of Delta, JFK IAT and the Port Authority of New York and New Jersey (PANYNJ), and you have the ingredients for a very complicated project. The following BIM software use case describes how Satterfield and Pontikes Construction utilized Assemble to address challenges during design and construction management, to control the budget, provide quick turnaround to design changes, manage the construction schedule, gain efficiency in field management, quickly report on a variety of trends and win the Design Assist and Construction Management contracts for Phase II and the Design Assist contract for Phase III of the Delta JFK IAT Redevelopment Program. 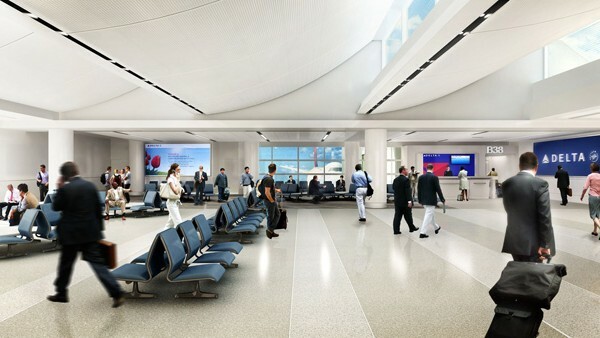 The Delta JFK IAT Redevelopment Program, is a multi-project, multi-phase program, estimated at nearly 1.5 billion, over an approximately 10 year span. Phase II is a project at Terminal 4, which includes the addition of 11 regional jet gates, and many other smaller projects spread throughout the terminal. Terminal 4 is managed and operated by JFK IAT, and regulated by the PANYNJ, the project has a perpetual cycle of design, review, and construct. Though not a fast track project, the multiple parties involved and the evolving needs of the airline challenge the design and construction schedule, as program requirements change and design review runs into planned phasing and site logistics.